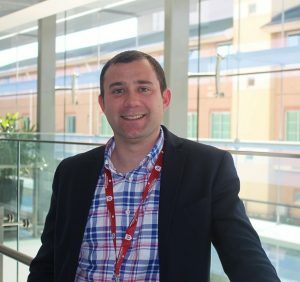 Specialist care: Dr Matthew Malone says the High Risk Foot Service at Liverpool Hospital helps patients reduce their risk of limb amputation. A multidisciplinary clinic at Liverpool Hospital is ensuring patients at high risk of losing a lower limb to diabetes or other health problems can keep on top of their symptoms. The hospital’s High Risk Foot Service is staffed by specialist clinicians from multiple areas of medicine, nursing and allied health. Together they help patients reduce their risk of limb amputation. Head of department Dr Matthew Malone said the clinic allowed patients to see multiple clinicians in one place on the same day. “A person with a complex foot problem can attend the clinic and see several specialists who manage infection, wounds, surgery, vascular disease, diabetes and other problems affecting the health of a patient’s limbs,” Dr Malone said. Dr Malone said events like the current Wound Awareness Week (July 15-21) helped patients understand when they needed to seek help for any wounds they may have, particularly those caused by diabetes. “Diabetes prevalence is growing around the world, and Australia is not immune to this,” he said. “This means we unfortunately see many people at risk of losing a limb. “We want people to understand wounds and foot problems so they can seek help in time to preserve the limb and maintain their quality of life.